Hi ya everyone! 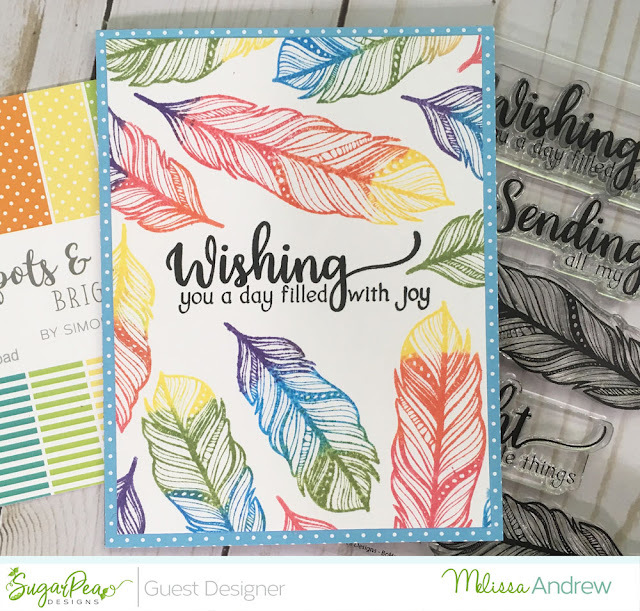 Today I created this fun colorful card with my memento colorful inks and the beautiful new stamp set from SugarPea Designs! I love these stylish feathers and the sentiments are just lovely. Make sure to join the blog hop to win prizes!! All the new stamps and dies will be released Friday! Whoa! I love your rainbow feathers!! Beautiful. I love the colorful feathers. Such a delightful card! Beautiful colors!!! What a beautiful idea to have the feathers 3 colors. Wonderful card. Such a great job with the feathers! I love this! Love the multi-colored feathers! Pretty card! That’s beautiful, love how you made them different colors. Love the multi-coloured feathers! So pretty. Oh wow ! All these colorful feathers are a pure delight !! Oh so pretty! Such beautiful and happy colors.